Out of all the places we visited in Japan, Nara was our biggest surprise. We must admit we had never heard of it before landing in the place of the rising sun but after a few weeks of traveling around Japan and listening to locals and fellow travellers we soon added Nara to our Japanese itinerary. We are so glad that we did as we had an amazing few days in Nara. From temples to the famous friendly deer, Nara is well worth a visit for a few days. If you are visiting Nara soon you will need accommodation. 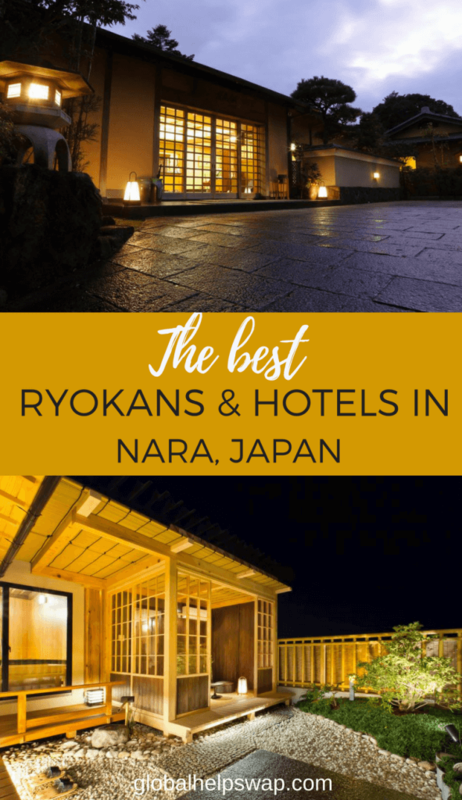 Below is a list of some of the best Ryokans and hotels in Nara to help you choose where to stay. Kotono yado Musashino offers accommodation in Nara, and is located just a 11-minute drive from Nara Station on the Kintetsu Nara Line. Free WiFi is provided throughout the property and free private parking is available on site. Every room includes a flat-screen TV. You will find a kettle in the room. Rooms include a shared bathroom. For your comfort, you will find slippers and a hair dryer. The ryokan also offers free use of bicycles. Kofuku-ji is 0.7 miles from Musashino, while Kasuga Taisha is 350 yards from the property. The nearest airport is Osaka Itami Airport, 24.2 miles from the property. This property is a ryokan, which is a type of traditional Japanese Inn. Previous guests love the food, the rooms and the attentive staff. Click here for the latest prices. Asukasou is a very popular Ryokan in the heart of Nara. The hotel is about a 10-minute walk from Kintetsu Nara Train Station and 0.9 miles from JR Nara Train Station. Todai-ji Temple is a 20-minute walk. Bicycles can be rented. A Japanese multi-course (kaiseki) dinner is served at Kachomon Restaurant, or in the Japanese-style guest rooms. Guests in the Western-style rooms can choose to upgrade their dinner to include tempra and charcoal grill dishes at an extra charge. The hotel has a coffee lounge on the first floor. Previous guests loved the location, the rooms and the food. Click here for the latest prices. Heijo Ryokan is just 10 minutes from JR Nara Train Station on the free shuttle, Heijo offers a summertime outdoor pool, a tea cafe and hilltop views of Nara city. Guests can enjoy a traditional in-room breakfast and dinner in the Japanese-style rooms. 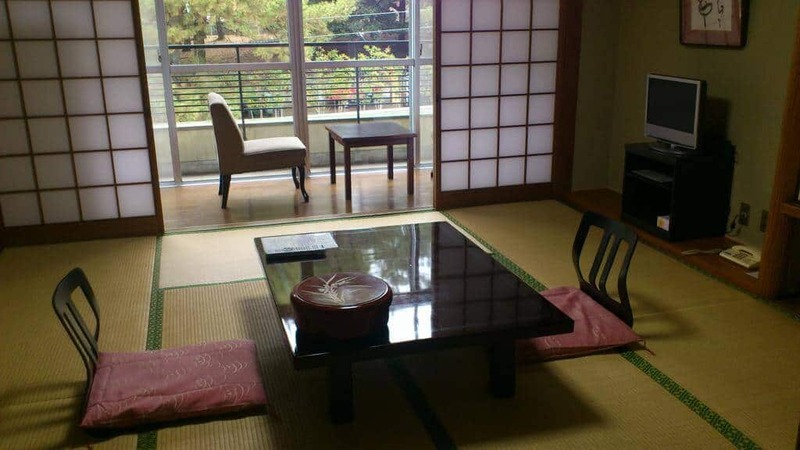 Each room at Heijo Ryokan is air-conditioned, with an LCD TV, a fridge and green tea. All include a private bathroom and slippers, and some have city views. Guests sleep on a tatami (woven-straw) floor in Japanese futon bedding. In winter, a warm stone disc is provided to warm guests’ feet. The shuttle from Nara Station must be requested at time of booking. Free parking is provided, and the property is a 10-minute drive from Nara Park and Kasuga Taisha Shrine. Todaji Temple and Nara National Museum are a 7-minute drive. Guests can enjoy the pool in July and August, and a gift shop sells unique local wares year-round. Hot public baths offer a chance to unwind in the Japanese way. A set breakfast and multi-course Kaiseki dinner are served. Dinner consists of regional specialities made using fresh local, seasonal ingredients. Previous guests love the stunning views, the public onsens and the food. Click here for the latest prices. Hotobil Ryokan is a picturesque Japanese-style guest house. 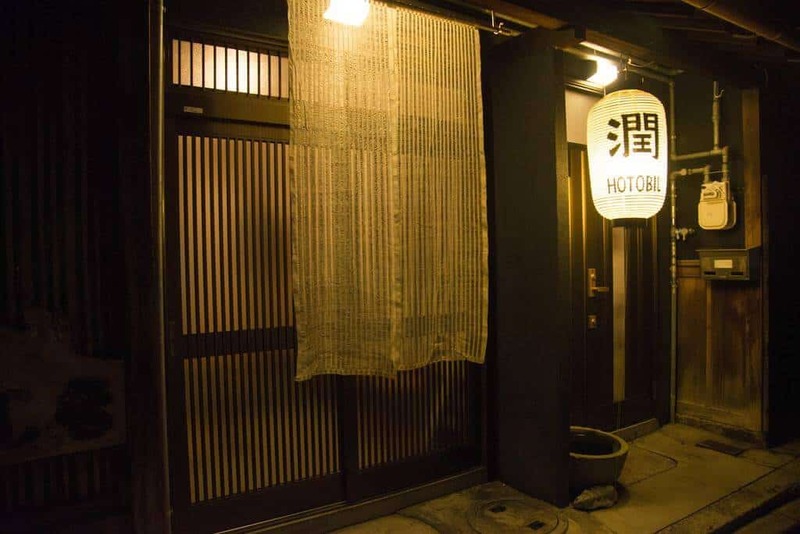 Hotobil is centrally located in Nara, 10 minutes by taxi from JR Nara Station. It features free Wi-Fi, a launderette and free parking. This hotel is for women and their families only. Guest house Hotobil has 2 rooms, both with a tatami (woven straw) floor, a low table with seating cushions and a flat-screen TV. Guests sleep in traditional futon bedding on the floor. Bathroom facilities are shared. The guest house has a living room with a flat-screen TV, a table and chairs, as well as a kitchen for shared use. Guests may find Hotobil’s cute dog sleeping in a sunny spot. Japanese home cooking is served at the dining area, and room service is available. Hotobil is a 10-minute bus ride from the Nara National Museum, as well as from both Kofuku-ji Temple and Todai-ji Temple. It’s a 2-minute walk from the Tanaka-machi bus stop. Guests have enjoyed the fact that it’s a homestay, the home-cooked food and the quiet neighborhood. Click here for the latest prices. Hotel New Wakasa is just a 12-minute walk from the Kintetsu Nara Train Station. Hotel New Wakasa offers Japanese-style rooms with tatami (woven-straw) flooring. A spacious public bath and foot bath is available for guests to relax in. Free luggage before and after check-in is available on site. Free WiFi is available at the entire building. The air-conditioned rooms feature Japanese futon bedding and a separate seating area. Each provides a flat-screen TV, a refrigerator, and an electric kettle with green tea bags. The en suite bathroom includes a hairdryer. 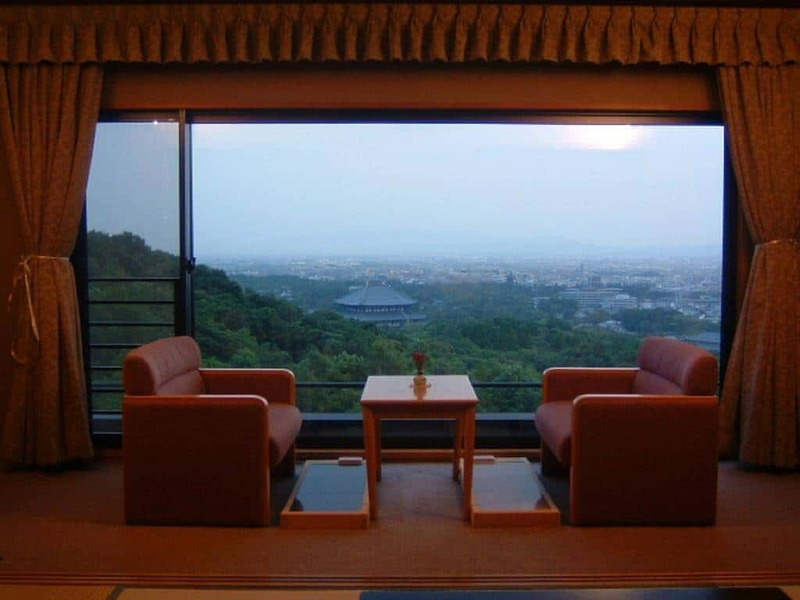 Guests can go to the roof terrace for a beautiful view of the Mount Wakakusa and the Todaiji Temple. A private spa pool with the same view can be requested with an extra cost. A Japanese dinner and breakfast are served in the dining room. New Wakasa Hotel is an 5-minute walk from the Todaiji Temple, and a 15-minute walk from the Nara Park. It is also an 8-minute walk from Isuien and an 80-minute bus ride from Kansai Airport. The property provides free guided tours in English to guests as a service. English maps and information are available on site as well. Previous guests have loved the large meals, the level of service and the beautiful setting. Click here for the latest prices. 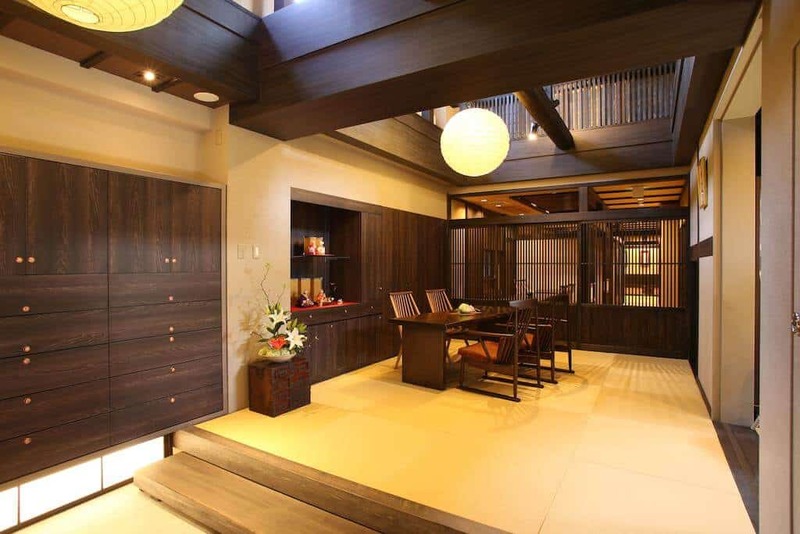 Soundproof rooms feature a serene interior with a tatami (woven-straw) floor, low furniture and shoji paper screens. Amenities include a flat-screen TV with satellite channels, a fridge and toiletries. Guests sleep in Japanese futon bedding, and the rooms come with an all-wooden bathroom. Luggage storage is offered before and after check-in/check-out. English maps for exploring the area are available, and the property staff organises free tours guided in English for staying guests. Annex Wakasa serves Japanese cuisine for breakfast and dinner at the dining area. Dinner is a traditional kaiseki multi-course meal featuring seasonal dishes. 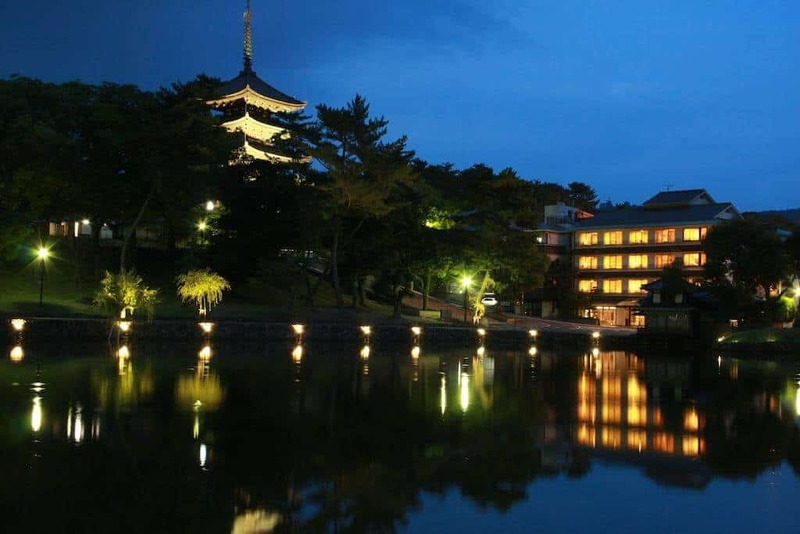 The hotel is an 8-minute walk from Japanese garden Isui-en, and a 15-minute walk from Nara Park. Nara Train Station is a 12-minute walk, while Kansai Airport is 80 minutes by bus. 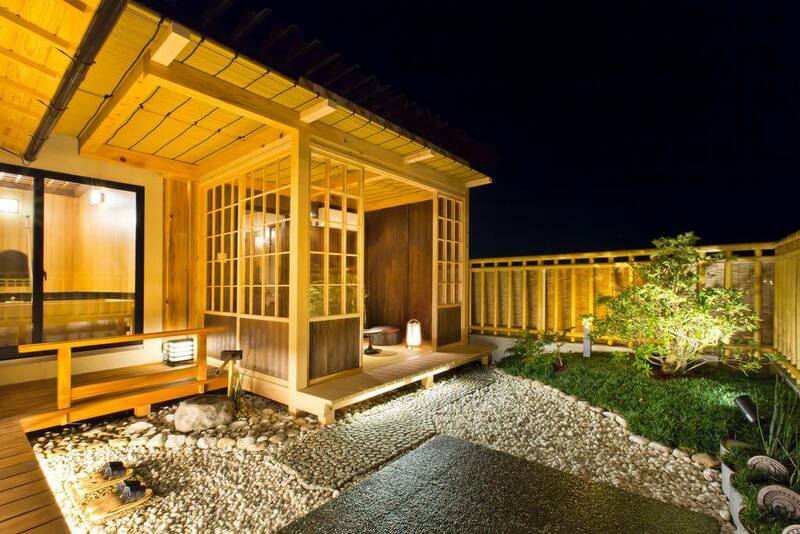 This property is a ryokan, which is a type of traditional Japanese Inn. Previous guests have enjoyed the fact that its near Nara Park, the mix between modern and traditional and the rooms. Click here for the latest prices. 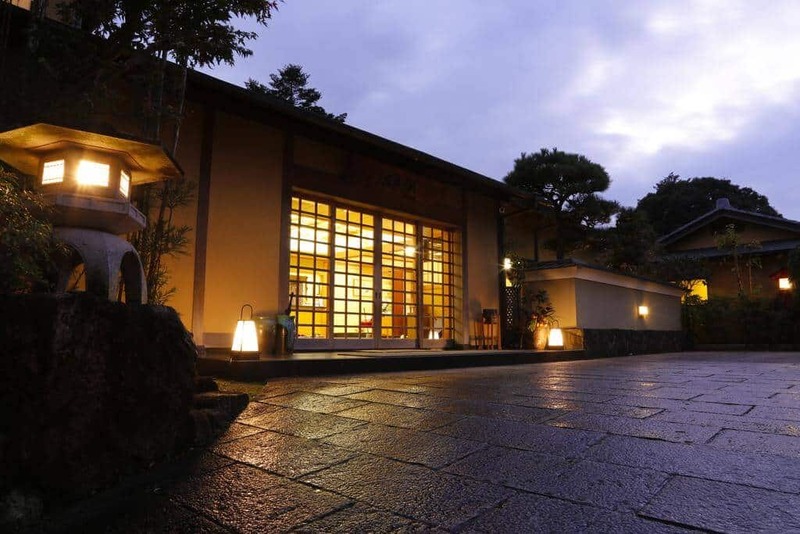 Sarusawaike Yoshidaya is one of the most popular places to stay in Nara. 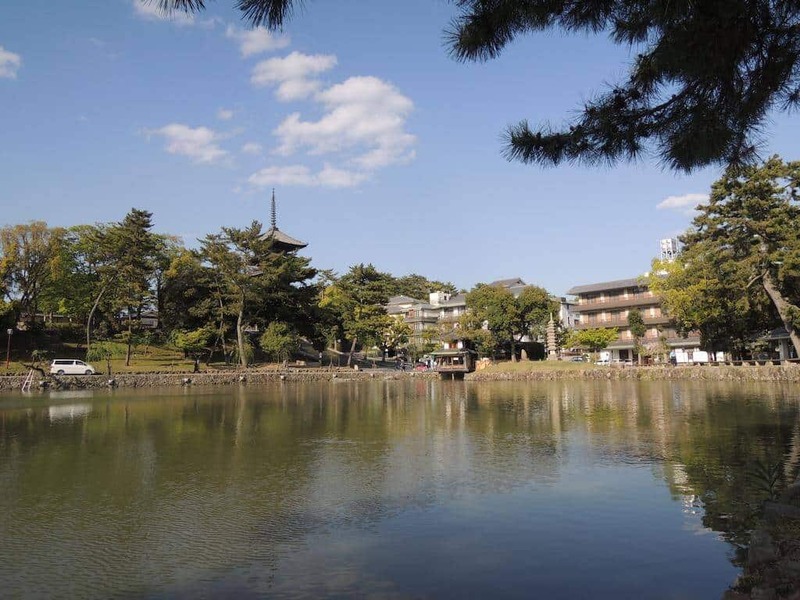 Offering public baths, Sarusawaike Yoshidaya is situated in front of Sarusawa-ike Pond. Kofuku-ji Temple is just a 2-minute walk away. Free WiFi is available on site. Each air-conditioned room includes a seating area, a fridge and flat-screen TV with satellite channels. The bathroom comes with free toiletries. Nara Park with Todai-ji temple and Kasuga Taisha are a 15-minute walk from Yoshidaya Sarusawaike. It takes 8 minutes on foot from Kintetsu Nara Train Station, and 15 minutes from JR Nara Station. Guests can request to have meals at least 2 days before arrival. No-fish meals can be arranged upon request. Other guests have loved the views of the lake, the service from the staff and the quiet location. Click here for the latest prices. Daibutsukan Ryokan is a traditional style Japanese Inn. Built in the Taisho era, Daibutsukan is located in front of the Five-Storey Pagoda at Nara’s Kofuku-ji Temple. It offers a large public bath, free parking on site and free Wi-Fi in public areas. Rooms boast views of the Five-Storey Pagoda. From Kyoto Station, the property is a 50-minute train ride and walk away. 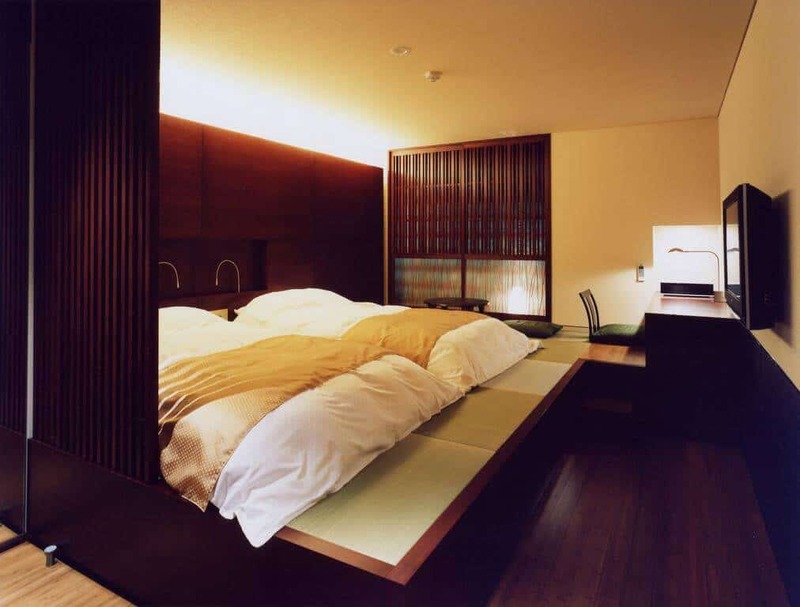 Japanese-style guest rooms feature tatami (woven-straw) flooring and traditional futon bedding. Each is equipped with a fridge, an electric kettle and a flat-screen TV. The en suite bathroom comes with toiletries and a bathtub. JR Nara Train Station is a 5-minute bus ride away, while Kintetsu Nara Station and Naramachi are both just a 10-minute walk from the Daibutsukan Inn. The property is a 15-minute walk from Todai-ji Temple and a 20-minute walk from Kasuga Taisha Shrine, both UNESCO World Heritage sites. Isuien Garden is also located a 15-minute walk from the inn. A Japanese breakfast can be enjoyed at the dining room, if accommodation is booked including breakfast. Previous Guests have loved the breakfasts, the staff and the location. Click here for the latest prices. Ryokan Kosen is just a 5-minute walk from Kintetsu Nara Train Station and a 6-minute walk from Kasuga Taisha Shrine, Ryokan Kosen offers free WiFi at the lobby and traditional Japanese-style rooms with air conditioning, an LCD TV and a private bathroom. A hot public bath is also available. Each room at Kosen Ryokan has a Japanese-style seating area with floor cushions, which is moved to the side of the room at night to make room for futon bedding. The floor is made of tatami (woven straw). Rooms have a simple décor featuring sliding paper screens. Kofukuji Shrine is a 6-minute walk from the ryokan, and the Nara National Museum is an 8-minute walk away. Todaiji Temple and Isuien Garden can be accessed within a 15-minute walk, while JR Kyoto Station is a 5-minute taxi ride away. Kansai International Airport is a 1 hour and 40-minute bus side. A set-menu Japanese breakfast is available for an extra fee if reserved in advance. It is served either at the dining room or in guests’ rooms. Internet access is not available at this property. Previous guests have enjoyed the location, the views of the lake and the rooms. Click here for the latest prices. Do you know of any other accommodation in Nara that you would recommend? Please let us know and we’ll feature them. From Tokyo to Kawaguchiko – An amazing Trip to Mount Fuji – If you are staying in Tokyo then you MUST visit Mount Fuji. Where to stay in Kyoto (and how to make the most of your trip) – Just down the road from Nara, read where to stay in Kyoto. Nakasendo Trail (Following Ancient Footsteps In Japan) – Read about Paul’s experience on an ancient Japanese walking path. The Yaeyama Islands, Okinawa: Japan’s Tropical Paradise – You didn’t know that Japan had tropical islands? Neither did we until we discovered them.